Va-va-voom! It’s technically true that Sophia Loren turns 80 at the end of this month. Really, though, she’s ageless—a silver screen legend forever fixed in the popular imagination as Cinecitta’s voluptuous ‘60s pin-up girl, her face an architecture of vaulting brows and bee-stung lips. A great friend of Mr. Valentino’s, Loren was born Sofia Villani Scicolone, and raised in Naples and Rome. Early on, her beauty was her calling card—at fourteen, she placed in the Miss Italia pageant, and soon after was cast as an extra in the film Quo Vadis. She went on to become Italy’s most renowned actress, known both for her films made in Italy with the likes of Marcello Mastroianni, Vittorio de Sica, and her husband, producer Carlo Ponti, and for her Hollywood roles, such as that of Doña Ximena in El Cid. She won an Academy Award for her gritty performance in De Sica’s Two Women, about a mother trying to protect her young daughter from the horrors of war. Loren had plenty of material to draw from, there: During World War II, her neighborhood was often targeted for bombardment, and she still bears a shrapnel scar on her chin. Half a century later, Loren was onstage at the Academy Awards to collect an honorary award for her contributions to world cinema. She wore Valentino for the occasion—no surprise, given her longstanding relationship with Mr. Valentino, and with the house. In her Cinecitta days, Loren was a regular customer—and in 1992, she joined Mr. Valentino at the opening of the “Valentino: 30 Years of Magic” show at the Seventh Regiment Armory in New York. It was a singular event, with Aretha Franklin, Placido Domingo and Bette Midler singing “Happy Anniversary to You” to Mr. Valentino, Mr. Giammetti and a crowd that included such fashion industry legends as Oscar de la Renta and Pauline Trigere. 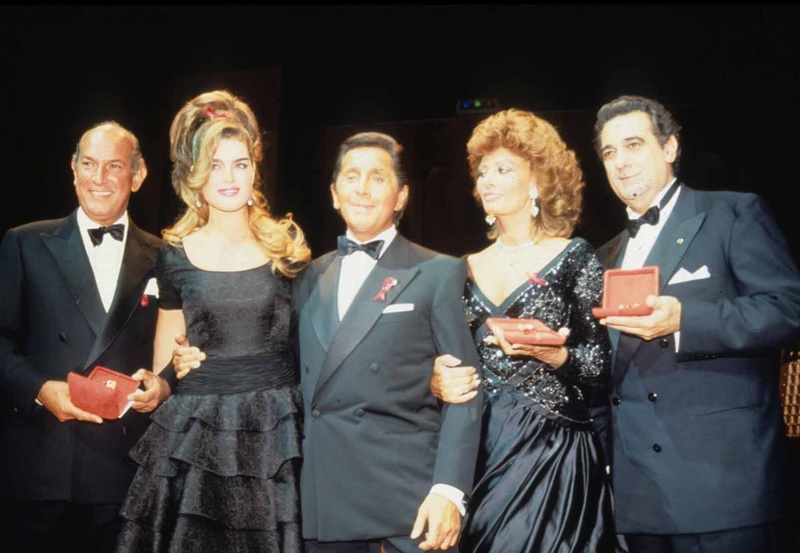 But nothing could top the vision of Sophia Loren, still va-va-voom in black Valentino, sweeping onstage to receive an award for her world on behalf of abused children. Such is the power of an icon. Happy birthday Sophia!